On this day in history, January 4, 1776, Samuel Nicholas leads the first US Marines mission aboard the USS Alfred. Samuel Nicholas was born in Philadelphia to a wealthy blacksmith. He attended Philadelphia Academy and was intimately involved with Philadelphia "high society." He became a member of the exclusive "Schuylkill Fishing Company," which was a fishing and social organization, at the age of 16. In 1766, he helped found the Gloucester Fox Hunting Club, one of the earliest hunting clubs in America. Nicholas became the proprietor of a popular Philadelphia eatery called the Conestoga Wagon at some point in the early 1770s, probably because he was courting the owner's daughter, Mary Jenkins, whom he later married. Nicholas also attended a Freemasons group that met at Tun Tavern. When the American Revolution began, Congress asked Nicholas to form several battalions of marines for its new navy, not because of any experience he had at sea, but because of his extensive associations in the city through its taverns. It was believed that a lot of good sailors and able fighting men could be found in them. Nicholas was commissioned as a "Captain of Marines" on November 5, 1775 and received a written commission on the 28th, the first official appointment for the Continental Navy or Marines. 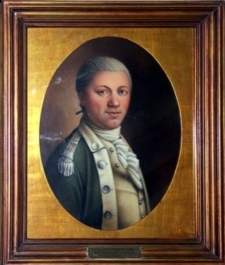 Through December, Nicholas recruited and trained several hundred marines from his headquarters at Tun Tavern and formed them into 5 companies and two battalions. On January 4, 1776, they left Philadelphia on their first mission aboard the USS Alfred, along with Captain Nicholas, Admiral Esek Hopkins and First Lieutenant John Paul Jones aboard. 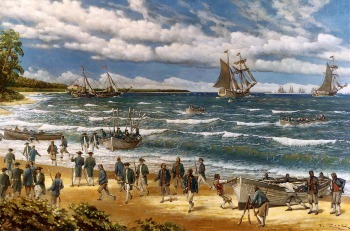 Commander Hopkins took the small fleet to New Providence in the Bahamas where Lord Dunmore, the Royal Governor of Virginia had transported a large store of weapons to be held safely from the rebels in Virginia. They arrived at New Providence on March 3 and Captain Nicholas led his 284 Marines in their first land attack the following day. They took the city of Nassau and two forts virtually without a fight and captured 88 cannons, 15 mortars and a large supply of other military items. The Battle of Nassau is sometimes called the most successful American naval venture of the Revolution. On the return mission, Nicholas' men participated in the first sea battle involving the Marines when the Alfred ran into the HMS Glasgow, a British warship. After returning to the colonies, Congress promoted Nicholas to Major, assigning him to recruit and train more marines. Nicholas and his men were sent to join George Washington during the British invasion of New Jersey and assisted him in the Battle of Princeton, the first time the Marines were put under command of the army. When the British evacuated Philadelphia in 1778, Nicholas was transferred back to the city to resume the training of more marines, even though he requested to be put aboard the new ship, USS America, being built in Maine, with some of his marines. Congress believed he was more valuable in his training and organizational role and ordered him to stay in Philadelphia, which he did until the end of the war. Samuel Nicholas is considered the First Commandant of the US Marines for his role in forming this branch of the US military. He was buried in the cemetery at the Arch Street Friends Meeting House on his death in 1790 during the Yellow Fever epidemic of that year.